Purpose: To assess the capability of 18F-FAZA PET/CT in identifying intratumoral hypoxic areas in early and locally advanced non-small cell lung cancer (NSCLC) patients and to compare 18FFAZA PET/CT with 18F-FDG PET/CT and histopathological biomarkers and to investigate whether the assessment of tumour to blood (T/B) and tumour to muscle (T/M) ratios provide comparable information regarding the hypoxic fractions of the tumour. Materials and Methods: Seven patients with NSCLC were prospectively enrolled (3 men, 4 women; median age: 71 years; range 63-80). All patients underwent to 18F-FDG PET/CT and 18F-FAZA PET/CT before surgery. Maximum standardized uptake value (SUVmax) was used to evaluate 18FFDG PET/CT images, while 18F-FAZA PET/CT images have been interpreted by using tumour-toblood (T/B) and tumour-to-muscle (T/M) ratio. Surgery was performed in all patients; immunohistochemical analysis for hypoxia biomarkers was performed on histologic tumor samples. Results: All lung lesions showed intense 18F-FDG uptake (mean SUVmax: 7.35; range: 2.35-25.20). A faint 18F-FAZA uptake was observed in 6/7 patients (T/B < 1.2) while significant uptake was present in the remaining 1/7 (T/B and T/M=2.24). On both 2 and 4 h imaging after injection, no differences were observed between T/M and T/B (p=0.5), suggesting that both blood and muscle are equivalent in estimating the background activity for image analysis. Immunohisotchemical analysis showed low or absent staining for hypoxia biomarkers in 3 patients (CA-IX and GLUT-1: 0%; HIF-1α: mean 3.3%; range 0-10). Two patients showed staining for HIF-1α of 5%, with CA-IX being 60% and 30%, respectively and GLUT-1 being 30% and 80%, respectively; in 1/7 HIF-1α was 10%, CA-IX was 50% and GLUT-1 was 90%. In one patient a higher percentage of HIF-1α and CA-IX (20% and 70%, respectively) positive cells was present, with GLUT-1 being 30%. Conclusions: To the best of our knowledge, this is the first paper assessing hypoxia and glucose metabolism in comparison with immunohistochemistry in patients candidate to surgery for NSCLC. Although including a small number of patients, useful insight regarding correlation between imaging and immunohistochemistry are reported along with methodological suggestions for clinical practice. 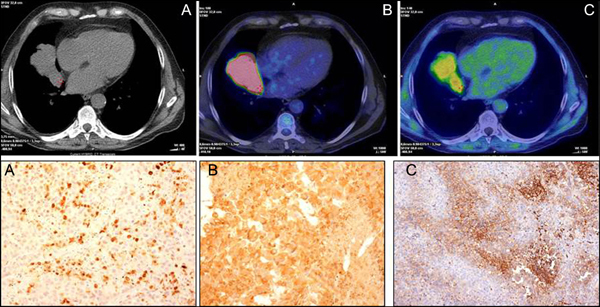 Keywords: 18F-FAZA, 18F-FDG, PET/CT, non-small cell lung cancer, hypoxia. Keywords:18F-FAZA, 18F-FDG, PET/CT, non-small cell lung cancer, hypoxia. Abstract:Purpose: To assess the capability of 18F-FAZA PET/CT in identifying intratumoral hypoxic areas in early and locally advanced non-small cell lung cancer (NSCLC) patients and to compare 18FFAZA PET/CT with 18F-FDG PET/CT and histopathological biomarkers and to investigate whether the assessment of tumour to blood (T/B) and tumour to muscle (T/M) ratios provide comparable information regarding the hypoxic fractions of the tumour.